Former Manchester United manager Jose Mourinho is reportedly ready to take the Bayern Munich job as long as they meet his big demands in the transfer market. According to Don Balon, the Portuguese tactician is emerging as a replacement for the struggling Niko Kovac at the Allianz Arena, and has some big potential signings in mind if he takes the job. The Spanish outlet state Mourinho would want to swoop for Liverpool goal machine Mohamed Salah, as well as Chelsea midfield general N’Golo Kante. Both are among the finest players in the Premier League and even the world, and would be superb purchases to turn things around for Bayern after a disappointing season for them in the Bundesliga. Salah would be ideal as a long-term replacement out wide for Arjen Robben, while Kante would add energy and quality to their midfield. 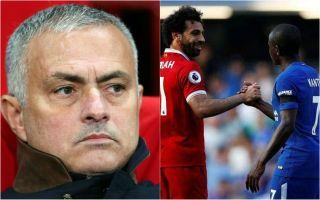 Mohamed Salah to Bayern Munich under Jose Mourinho? These would be ambitious targets, however, and it remains to be seen if the Bavarian giants could realistically deliver them to Mourinho. Finally, Don Balon also claim Mourinho would want to sign Paris Saint-Germain midfielder Adrien Rabiot for Bayern as well. A previous Don Balon report linked Mourinho with Real Madrid after his exit from United last month.